Innovating teachers know that posting and showing the learning goal is very important for student success. 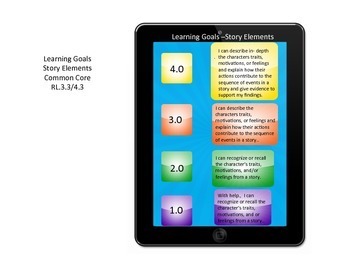 Well lets go a step further, and post a rubric containing the learning goal so students can reflect on how they are progressing. Adapted from Marzano's 4 point rubric, I have created two rubrics that have the learning goal broken up by a 4 point rubric. These can be used in grades 3 and 4. I created one for story elements RL.3.3/4.3 and Themes/Central Ideas RL.3.2/4.2, RI.3.2/4.2. I also used great IPAD clipart that supports 20 century ideas which kids love. I will be creating more, but this is a start.